Happy Sunday, leaders! I hope that all is going well in your world and that your weekend so far has been both restful and productive. We’re less than two months from the launch of my upcoming book ‘Inverted Leadership: Lead Others Better By Forgetting About Yourself’, and so in the next five weeks I’ll be sharing excerpts from my previously-published ebook ‘(Extra)Ordinary Leadership: 10 Things Dad Taught Me Without Saying Anything.’ I hope you enjoy these, and I look forward to your feedback. Also, be sure to email me and let me know if you’re interested in being part of the launch team for ‘Inverted Leadership’! Without further ado, here’s this week’s update. Principle 1: Always show respect to others, even when they don’t extend you the same courtesy. ‘Respect’ is a practical outworking of the ‘Golden Rule’ of our childhood: treating other people the way in which we would like to be treated. It encompasses many other positive traits as well: humility, deference, trust, giving credit where it is due. At its core, respect is showing love to others in the way we ourselves wish to be loved. It is seen in the way we expect children to treat their parents, students their teachers, and young people their elders. It is the way a soldier is supposed to respond to an officer, or the way a player responds to a coach. This is Erik, who showed me such great respect when I didn't deserve any at all. Still a mentor and a friend over 20 years later! In all of the preceding examples, however, the respect is shown upward; that is, it is seen in a vertical relationship from one person to another person, with the second person holding a position of authority over the first. This is as it should be, as in every area of life authority figures expect to be treated in a certain way, as this helps maintain order and structure and stability. However, respect shown in the opposite direction, downward as it were, or even horizontally, as amongst colleagues, tends to be even more powerful in its impact because it is not commanded or demanded respect. There often is no punishment or negative consequence inherent in failing to show respect horizontally or downward. However, to do so, to show respect in those ways, is to do what is unusual; and because it is unusual it causes more of an impact. The evidence for the impact of this is obvious to anyone who has been the recipient of this type of ‘undeserved’ respect. As a teenager, I received this from my high school soccer coach and youth leader, Erik, and it was this respect that caused me to have such a high regard for him. He has been, after my dad, the largest male influence in my life since I was fourteen years old. He treated all of his players well, he treated the youth group well, and I have never heard a former player or youth member say a negative word about him. This is not to say he was permissive; in fact, Erik was quite strict with us in many regards. But when he disciplined us, it was always tempered with love and respect, and therefore we knew, even when we were in trouble, that he cared about us. It was the same way with my father, who spent twenty years as an officer in the U.S. Army. After his death, I interviewed several soldiers who had served under his command during the Vietnam War. To a man, they said that Dad was not ‘popular’ in the normal sense of the term (i.e., not everyone liked him), but every soldier I spoke to said that they respected him as an officer and as a person because he was tough but fair, and most importantly, they all knew he would do everything possible to bring them home safely. In the words of Ronnie Smith, who served under Dad in Vietnam, “We didn’t like your father in Vietnam. But later we realized what he had done. He was hard on us, and he brought us home.” In a war whose merits were dubious at best and are still debated by historians today, he went out of his way to avoid risking soldiers’ lives unnecessarily. This was done through a strict adherence to the rules and by treating his soldiers in such a way as to cause them to also be alert and attentive to their duty. As a result of Dad’s respectful treatment of the soldiers under his command, and their combined efforts to do their jobs well, all of Dad’s soldiers (so far as I have been able to determine through research) came home alive, despite seeing combat enough and to such a degree that Dad earned three bronze stars during his time in Vietnam. And, what may be even more important and impactful, Dad continued to show these soldiers respect throughout his lifetime by keeping in touch with them and by visiting army friends on various occasions. For example, after he was diagnosed with cancer in 2007, Dad attended a reunion of some of his soldiers from their time together in Vietnam, and many of them expressed gratitude (as well as some surprise) that he, as their commanding officer, would actually care enough about them to come to such a reunion. He spoke to them individually, shook their hands, and thanked them for their service even though decades had elapsed since their service had ended. This type of respect, shown to people who were formerly under his command and authority, spoke volumes to those soldiers and, when I heard about it, to me. Dad’s respectful treatment of subordinates was not limited to his time in the military; it was his habit to do this also to his colleagues and employees in the civilian workplace. One woman, Veda, worked with him in an army depot that refurbished military supplies, and she told me via email of how he often went out of his way to teach her extra information related to their tasks and to the items and equipment being refurbished. He would spend time answering various questions about how the materials would be used in the field, thus helping Veda to understand why her part in the process mattered and how it also thus contributed to the military effort at large. Through all their time together on the job, Dad treated her with a respect and courtesy that she remembers fondly to this day. 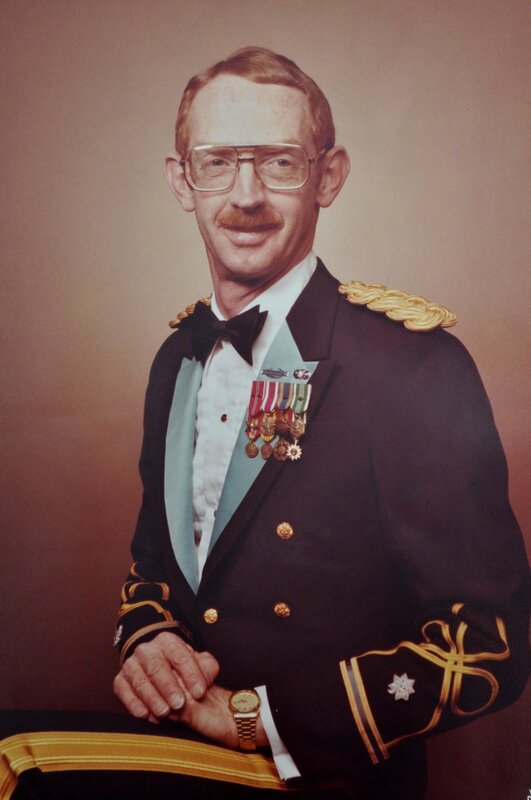 Dad in his dress uniform. He taught me many things just through how he lived, and he continues to teach me things even though he's been gone for 10 years. "John was our supervisor for a while at the [Anniston Army] Depot. I was the shipping clerk. So there were many occasions which he would have to go to the different buildings in search of needed parts. After a few trips to the buildings, people began to dread the thought of us coming through the door. Excuses abounded for not being on time, and your dad would clear his throat, take off his cap, and proceed to tell them, in government terms, how these things were to transpire. Never raised his voice, never used a condescending term, just as it should be. I would turn my head to keep from laughing because the looks on their faces were priceless. They didn’t even know what your dad did. It didn’t take many times until things would be coming to us, on time, and counted correctly. I never heard or saw him speak down to anyone in any way. He asked of people what they were to do, what they were capable of doing, and he expected that they do it correctly. I learned more from talking with him about things on the Depot than I did from the people who were supposed to know. It was nice working with someone who cared about what was going on and understood the urgency of what we were all doing." This type of regard and respect for the people he worked with made an impression, though it did not necessarily make him popular. Thus, there were times when people would treat him with less respect than either his military career or his occupational position deserved. However, according to Veda when this happened, “he never defended himself. He’d just turn and walk away.” Sometimes being respectful to others simply means refusing to respond, and Dad understood that as well. Action Step #1: Consider who you need to show respect to tomorrow that you didn’t show respect to today, and then go and do it. Principle 2: Control your temper—it’s yours, and only you can lose it. Emotions are complex, often deceptive, things. This obvious understatement of the case nevertheless serves as a way to first delve into the topic of emotions, how they relate to showing love to others, and how all of these things showed themselves in Dad’s life. 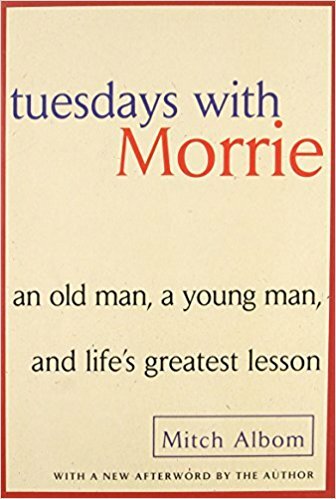 There are quite literally thousands of books about love, and there are probably even more ways than that to define what one means by ‘love.’ For our purposes, and as was explained in the introduction, love is not an emotion, but rather it is a choice, an action, and a habit (as opposed to a one-time act or moment). Defining love this way immediately puts us at odds with 21st century American pop culture, but then Dad was never really one for pop culture. Also, defining love by the standards of our culture is a debatable (at best) enterprise anyway, with so many different explanations floating about. For these reasons, and as Dad demonstrated throughout his life, love is more about what you do and say, and has much less to do with how you feel at any particular moment. Later in this book we will discuss numerous other emotions and how Dad was an excellent example of how to control them. For this chapter, the focus is specifically on anger, as it is in some ways different than all other emotions. Anger is different in large part because it has more power to destroy than any other. Joy, happiness, and other positive emotions can all destroy (in one sense) if a person pursues them at the expense of other things. However, anger is rarely, if ever, an emotion that builds others up. Rather, it is almost exclusively an emotion that tears people down. There is a time and a place for it, though that comes about much less often than most people (myself included) might like for it to. Anger is not inherently bad, however. C.S. Lewis explains in ‘Mere Christianity’ that there are no ‘bad impulses’ or ‘good impulses’. Rather, all our impulses are good at sometimes and bad at others; in other words, there is a time and a place for anger. However, anger is one impulse that is more often negative in its effects than happiness, joy, or other ‘positive’ emotions. Unfortunately for many people around me when I was a child, anger is also one of the major emotions that I displayed, especially in the area of competitive sports. I'm very thankful that my daughters are kinder to each other than I was to my brother when we were that age. On numerous occasions, Dad talked with me about my anger and how it was harmful, damaging, and also just unhelpful toward my teammates, my siblings, or my family. He did not, however, articulate aloud the relationship between anger and a lack of love for others. He had displayed anger when I was young, and yet because I knew he loved me, I never saw a possible disconnect between anger and love. As I got older, however, I began to see that while Dad was great at loving people, he was also careful to not direct his anger at people in a hurtful way. I do have some memories of him doing this when I was young, especially toward my older brother. But as we got older, this happened only infrequently. After I became an adult, I began to see that Dad was unusual in how he displayed his anger. The older I got, the less often it appeared, and not only that, but it seemed to only appear after many attempts to change the situation without anger which proved to be unsuccessful. The first incident that comes to mind was at a church league softball game that we played while I was still in high school. One of my favorite memories of that time is playing in those softball with Dad. He had been a college baseball player, and I had grown up playing baseball as well. Even into his fifties and early sixties, he was one of the most skilled players on our softball team, and it was fun to be able to share the field with him. There are numerous different responses to this that would have been unhelpful, hurtful, or which would have simply escalated the situation farther. However, as I recall, Dad did not say anything in reply to this for a few minutes. As our player continued in his loud complaints, I remember Dad finally saying back to him, because of his continued boisterousness at what was supposed to be a friendly church league game, “Maybe you do need another father.” I remember thinking, “Wow, did Dad just say that? !” because Dad was not known for getting involved in that type of altercation. I do not remember another similar incident at all, in fact. Recalling the incident now, it amazes me further that Dad did not say his response viciously or in a negative way, but rather as a simple statement of fact: if this is how you are choosing to act right now, perhaps you do need someone to show you an example of how you should act in this type of situation. No anger, some irritation, but ultimately the goal was simply to try to get things back under control and be able to move on. 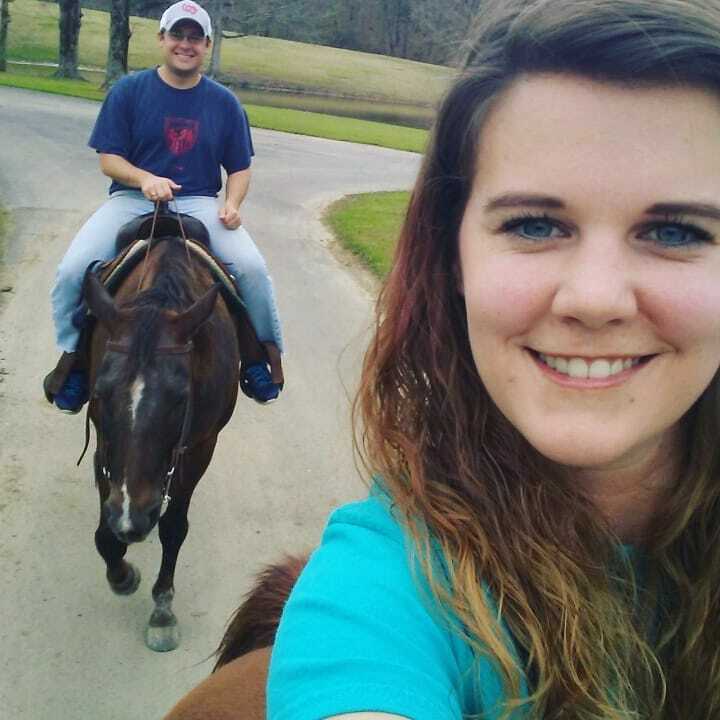 I was very glad to learn how to ride a horse from two experienced riders: my wife (pictured here) and my former student Cody (who was out ahead of us, leading the way). Now, to be fair, our player who was upset was an upstanding man in his own right. He was normally even-keeled, under control, and was a positive example both to the church as a whole and specifically for our youth group. I think that on this one occasion, his own desire to win, his competitive nature, simply got the best of him. That is something I can entirely empathize with, and so I do not fault him. Rather, as I look back now, I am both glad and a little surprised to see that Dad approached this situation in the same way he approached similar situations with me. In fact, since this man was not his son, though he could probably have been, based on the age difference, it is possible that Dad showed him more patience and grace than he showed me in similar situations. For example, within a year of this incident, I made an unintentional display of frustration at a softball game, and Dad’s reaction was definitely closer to anger. For some reason one summer my all-star baseball team had been invited to play in a slow-pitch softball tournament. There are obvious parallels between the sports, and so we decided to go and play. During the game, I struggled to adjust to the different strike zone of slow-pitch softball, and in my first at-bat, I struck out without swinging at a single pitch. I walked back to the dugout, visibly frustrated at having struck out. As I neared the dugout, I took off my helmet to toss it to a teammate who I thought was waiting for it. After I had let the helmet go, however, the teammate turned away and never made a move to catch it. As a result, the helmet crashed into the bat-rack, knocking over half a dozen aluminum bats onto the concrete floor of the dugout, making a tremendous noise. To everyone watching, Dad included, it looked as if I had thrown my helmet in anger and frustration, causing the loud noise and demonstrating a very poor attitude. This is certainly how Dad saw the situation, and so he very quickly came over to the dugout to talk with me about my attitude and actions. He told me, in his quiet-yet-stern tone of voice, that my actions were unacceptable and that anything else even remotely close to that type of display would be my last opportunity to play sports for quite some time. And I believed him. The older I get, the more I realized that this is one of many times when Dad would have been justified in displaying anger toward me. Now that I am a parent, I can see how one would be frustrated, embarrassed, and angered by this type of action from a child. However, Dad did not blow up at me, and he did not yell or create more of a scene that might have caused me to also respond in anger. He did talk to me very sternly, and he was very clear about his expectations for my future attitude and behavior. I understand now just how important that was, because though I do not know how easy or difficult it was for him to control his temper in that situation, I know that him doing it was the right way to go. Action Step #2: Carefully examine yourself today to see ways in which you are allowing your temper to control you. Acknowledge these so that you can then retake control of your emotions. Happy Sunday, everyone! Most people have already begun (and many have also already failed at) their New Year’s resolutions, so I thought instead of resolutions I would give you a quick update on recommended reading for this upcoming year. The good news is that it’s never too late to get started reading excellent books, so it’s a great way to not fail at your resolutions (for more info on how to do better at setting/reaching goals, etc, check out the excellent work being done by Michael Hyatt and Jon Acuff). So, below is a brief list of books I recommend for 2018. They are of different genres, but the two things that tie them together are: 1) I am recommending them only because I have read them and found them valuable, not because I just *think* they would be good books to read; and 2) they all contain encouraging information about both life and leadership that I think everyone will find valuable and helpful. They are not listed in any particular order (i.e., which I like best, or which are easiest to read, etc), they’re just all excellent books that I recommend to people all the time. If you’ve already read one or more of them, I would LOVE to hear what you think about the ones you’ve read. If you haven’t, then let me know when you have and we’ll talk about what you learned. So, without further adieu, here’s the list! I am a high school coach and former college player, and so I’m always looking to improve my coaching. One of my former college teammates who is also a coach (and far more accomplished than I am) recommended this book to me a few years back, and I owe him a huge debt for doing so (Thanks, Cush!). Messiah College in Pennsylvania has a soccer program that is the best in the country on both the men’s and the women’s sides. 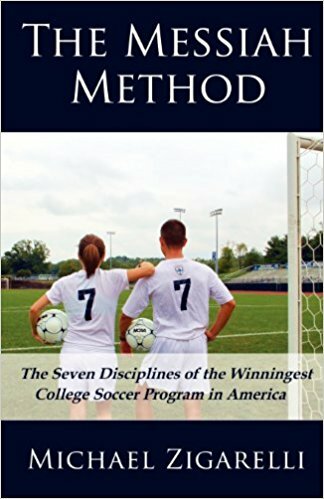 Their record of winning games and championships is incredible, and in this book Michael Zigarelli (himself a Professor of Leadership and Strategy at Messiah and a high school soccer coach) looks at the seven disciplines that Messiah has followed to create such an amazing program, regardless of changes in coaching staff. 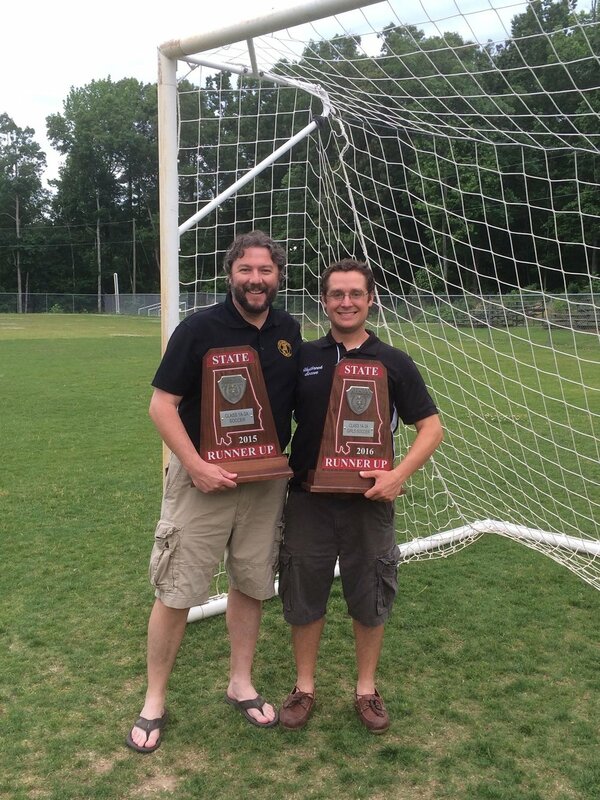 The book is not about coaching soccer as much as it is about creating a specific type of culture and atmosphere within this college community, and thus the lessons are applicable at high schools as well as in businesses and in the corporate world. Their success speaks for itself, but so does the testimony of one former player, which captures the incredible atmosphere and culture at Messiah: “I’d rather sit on the bench at Messiah than start anywhere else.” How many organizations have a culture that would inspire that type of attitude? Action Step: Pick one of these books and read it! Then, let me know what you think about it. As always, thanks for your time, and I look forward to hearing from you! 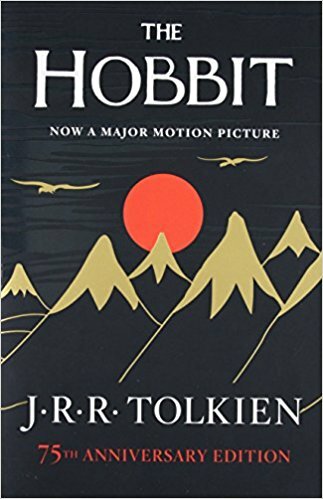 Let me know what you think about the list, and I would LOVE to discuss any and all of these books with you in the future. Have a great Sunday!